All our brake discs are mounted, purged and ready to use, supplied with plates already mounted and a 2 year warranty. Weight: 230g (without hard disk with adapter) Lever Material: Carbon Fiber Lever, Aluminum Body Design of the caliper 2 pistons, forged aluminum two-piece, adjustable Banjo Finishes: Black Red Hard: Hard HS1 200mm Insert: Sintered, Top Mount Fluid: DOT 5.1 Editing: Ambidextrous Adjustment: Adjustment of the contact point, setting the guard, Adjustable Banjo, Positioning Tri-Align Caliper? Special features: TaperBore Technology Compatible with MatchMaker, Necklace in two parts Technology: TaperBore Technology, MODULATION OF MAJOR MOTION POWER RESERVE GEOMETRY ™, CALIPER POSITIONING SYSTEM TRI-ALIGN ™, INTEGRATED RESERVOIR, DOT 5.1 SETTING THE GUARD WITHOUT TOOL CONTACT POINT ADJUSTMENT, MOUNTING PLATES BY THE ABOVE MATCHMAKER X COMPATIBLE Contact Point Adjustment ™ We are proud to be the company that invented this option before users know how much they needed. The setting of the contact point, you can customize the point where the brake lever actually engages. This allows you to make two simple but important things: 1. You can choose the position of your fingers when your brakes hang. So you can perfectly combine comfort fingers and braking without removing the pads. 2. Balancing both brake levers so they make contact at the same point has never been easier. The setting of the contact point is not only an adjustment of the guard (although all our levers have one too). Whether you prefer the modulation of a longer throw, the instantaneous power of a short throw, or one of the many intermediate options, this device will allow you to make a perfect race. TaperBore ™ Technology The term "TaperBore" refers to a unique and revolutionary locking system patent pending for our new Elixir and Code levers. It is lighter, has a very sleek, improves leverage and especially gives you more power and control. Deep Stroke Modulation ™ The boundary between fact sudden braking and brake so suddenly that you skate, is minimal. A Stroke Modulation allows riders to perfectly navigate that line problem and even control the most powerful brakes with finesse. Power Reserve Geometry At the end of the day, a brake lever simply multiples the force your hand generates (just like the nut cracker). Power Reserve Geometry ™ Avid is by itself a way of thinking about the physics of leverage and comfort of your hands. This philosophy is fundamentally different than others on the market brakes. Due to pivot placement, physics dictates that with other brake levers your fingers tend to slip off the ends as you pull. Avid is different. We designed our levers with the pivot closer to the handlebar, closer than anyone has ever dared to market. This reduces the inner lever stroke and an arc that naturally hugs your fingers, allowing you to provide greater stopping power. What's great is that every Avid lever has it. 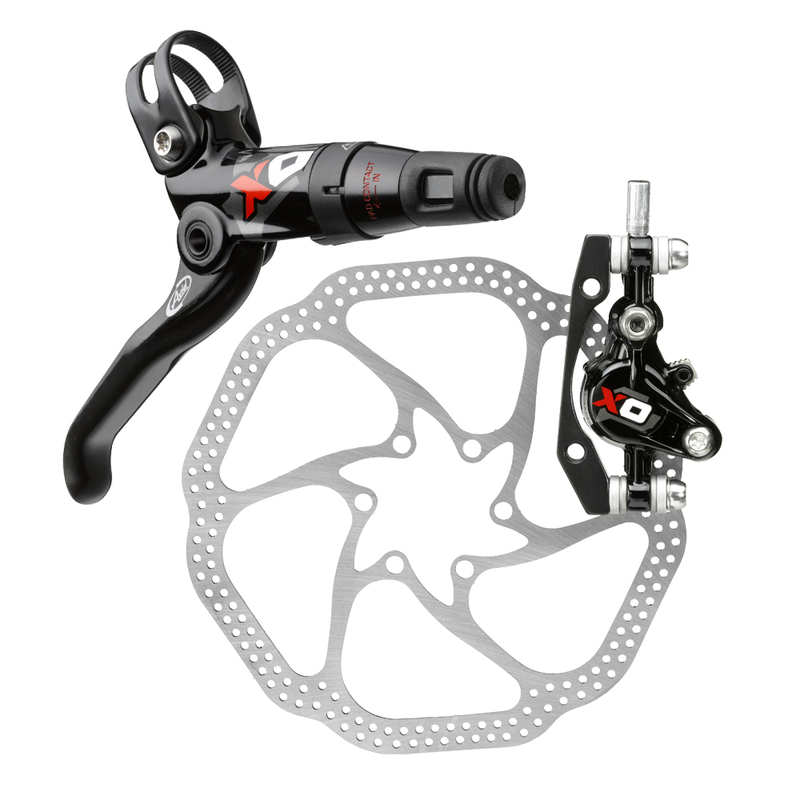 System of Tri-Align Caliper Positioning ™ Another original Avid technology making your life: it is no easier brake to install and adjust. With the positioning system of Tri-Align Caliper ™, aligning the caliper to the rotor literally takes seconds. Just loosen the CPS bolts, then press the brake lever while tightening the screws. Perfect alignment of the bracket, it's as simple as that. Mounting plates from above When maintaining your bike is the only thing between you and the road, every second counts. With our mounting pads from the top, the new disc brake pads can be installed without removing the wheel without having to work under the caliper or pad juggling upside down, so you'll be ready to go again faster. Comes with disc 200mm HS1, screws, adapter IS 200mm wafers and instructions in their original box.